You know you need them for an effective SEO strategy, but it isn’t as simple as it once was. Some links are pointless to chase. Others are even worse and will actively do harm to your website’s rankings. But when you’re first starting out, and scrapping for every single link you can find, it can be hard to see the forest for the trees. You can spend all day chasing links without being sure if the ones you get will be worth all the time you are investing in them. So, how can you tell if a link is worth getting? In this guide, we are going to list every single point of consideration to give you a foolproof strategy to cultivating a link profile full of quality links that will improve rankings for the long-term with no risk of being penalised. What exactly is a quality link? From a user’s point of view, a quality link is a hyperlink to another page that provides relevant, useful information that supports and extends the information of the page they are already on. From Google’s point of view, a quality link is a hyperlink that comes from another website that has a lot of authority and is trusted. In an ideal world these two definitions overlap perfectly, but in reality, this isn’t the case. Great information goes unlinked to and high-quality links are a commodity on the online market where merit is not always the deciding factor. While PageRank, which was Google’s official rating of a domains strength is officially dead, there are still tools out there that can help you define the relative strength of the domains where your prospective links are. Mozbar has two metrics, scored out of 100, that can help you get an idea of the strength of any website: Domain Authority (DA) and Page Authority (PA). Their names are pretty self explanatory in terms of what they represent. The scores are calculated using machine learning against the Google Algorithm to predict how well a website will rank and are logarithmic. Moz states that they use over 40 signals to create their scores. DA predicts the likelihood of any given page on the domain ranking while PA will give you the strength of the specific page you are on. When assessing a website for links the PA is a more important factor than the DA. If you’re being linked to from a home page or a page that is deep within the site and has very little page authority, there is a big difference in impact. Often however you will be getting links from brand new pages, such as new blog posts. These will always start with very little PA, but may grow over time depending on how new pages are linked to within the site architecture. Sometimes new blog posts will spend some time on the homepage until they get pushed off by newer posts, which will provide more value. Majestic SEO also have two metrics for you to use in evaluating websites: Trust Flow and Citation Flow. Citation Flow is a score out of 100 which measures the power of the website or link in question has to offer. The Trust Flow score takes into account how closely the website or link is connected to Majestic SEO’s network of ‘trusted websites’. These ‘trusted sites’ are found through manual review by Majestic. The above metrics are great for a cursory examination of a website but it should never be where you finish your research. In the end all that really matters is how Google measures your website, and there is no metric to find that out. As complex as the scores Mozbar and Majestic provide are, if they are fooled by some black hat practice that Google can detect – you’re screwed. So here are some other things you can consider when deciding if you want to pick up that link. Ask Yourself: Would I Want This Link if SEO wasn’t a Factor? If the answer is no then that goes a long way to answering your question. Remember, everything in the Google Algorithm is only meant to be an indication that a website is a valuable resource. If search engines did not exist you would still want links that pointed toward your website, because it gives you traffic. If you don’t think a link will ever provide this then consider ditching it. If it isn’t sending you any traffic, that means it is a useless link from the user’s perspective and that is a pretty good indication that the spam levels are high. Get the site in questions domain and plug it into ahrefs. Are they getting links from websites that have nothing to do with their niche? Do the links look like sponsored posts? Is their link profile full of websites with poorly-written, low-quality content? Are their links from websites that don’t look like they are for a genuine business, organisation or blog? Is their link profile dominated by blog post comments and forum post links? All of the above would point to the fact that the website in question has engaged in black-hat link building practices. It may not be penalised yet but chances are it is only a matter of time. And when it does get hit you don’t want to be seen as guilty by association (also the link won’t be worth much to you once the site’s authority plummets). As important as the links the website has pointing to it, is the anchor text of the links. Again using ahrefs, check what the mix of anchor text to the website is. A natural anchor link profile is going to be a large mix of website/brand name text, full url, variations of ‘click here’ or ‘read more’ plus a variety of contextual links. Contextual links (as you’ll read below) are the most valuable types of link for SEO and are therefore the most commonly exploited. Instead of naturally linking out to a relevant website on the most relevant phrase in the body of content, spammy websites will use exact match anchor text over and over again as a tactic to rank for that keyword. How do they link out to other websites? How do they link out to other people. Is it all exact-match anchor text to highly commercial websites? Then chances are it’s built purely for SEO and is not a real blog. Once you have checked all of the above you can be relatively confident that this website isn’t going to do any active harm to your website. However, absence of harm does not automatically point to a net benefit. The obvious question is: if a link isn’t going to hurt, why wouldn’t I just get it? Well the answer lies in how much time you will need to get a link. If you spend hours on outreach and content creation on a link that is going to have minimal impact, you aren’t having the maximum impact on your brand. Here are the top things to consider when deciding if a link is worth your time. Is it from a relevant source? You will be making better use of your time if you spend your time targeting relevant websites for your links. While there are obviously websites that are big and powerful enough you’d never turn down a link if you got the opportunity, when it comes to the lighter end of the scale chasing any and every website you can probably won’t give you much return for your effort. Google is big on semantics. When you get a link on a website it doesn’t arbitrarily raise your ranking ability for every keyword entered into its search algorithm. The areas you get a boost will be strongly aligned with the areas Google considers the source of your link to be an authority on. If you run a cake making business, a link from a blog about cars is not going to do much to advance your online strategy. This isn’t to say that the link will make no difference in building the strength of your website but the result will not match the time and effort required to secure the link in the first place. Will the link be contextual? Contextual links are the most valuable type of link for SEO. Google reasons that when a content producer links within the text, the page linked out to must be a relevant and quality example of what the writer is currently discussing. Otherwise why would they be pointing the user somewhere else? Opportunities that allow you to link within the body of the text are going to show better results than only allowing links in the bio, or via a directory listing, so take this into account when evaluating a link’s worth. Years of SEO misinformation have got some bloggers and webmasters scared to link out to perfectly legitimate sources and will therefore nofollow any link they put on their website. Nofollow links will usually not give you any noticeable SEO boost, unless it is from a high profile website that carries a lot of trust. So, when your contact tells you they will nofollow any link on their website, that is a good point to seriously reconsider whether it is worth the time, depending on the quality of the site. How hard is the link to get? As you start to get serious about link building you are going to come across a variety of different types of opportunities to get links to your website. Early on in your journey you will likely stumble across a blog or two that will give you full access to post blog posts without so much as having to submit your blog for approval. And you’ll probably feel like you’ve hit the jackpot. The important lesson to learn in this situation is: if it easy for you, it is easy for everyone else, and when a link is that easy to get it is rarely going to prove valuable. While it might be hard work creating high level content that needs to stand up to intense manual scrutiny, or sending out personalised emails to authority websites in your niche to try and establish genuine relationships, these are the type of tactics that get high level links. 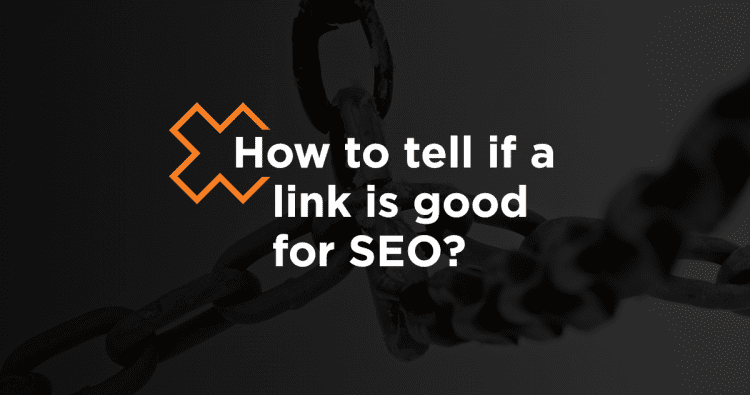 If a link is hard work to obtain that is usually a good indication that it is worth getting, as it suggests they are selective with their content and more likely to be a trusted website. A good link isn’t always about SEO metrics, its ability to send traffic to your site is super important. 2/ it’s a really simple way to measure the spammyness of the link. If you’re confident the link can send relevant traffic to you then chances are it’s a pretty natural link and not at risk of doing any harm.